Part of the enjoyment of doing stonework is helping people realise their vision in stone. 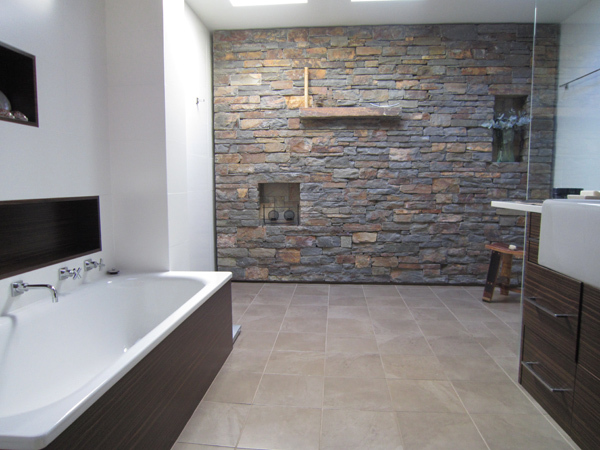 Having already completed an award winning renovation a few years back, Jo Reinhard knew what she wanted to complete her bathroom renovation for her property situated in the surrounding hills of Berry, a stone feature wall. Stonehedge believes form should follow function and with this in mind we created a floating feature wall complete with functional recesses and a mantle, ideal for personal intricacies. We were able to tweek Jo’s original design to really give it that modern ‘wow’ factor. These recesses add an element of interest to the stonework. Functional, they provide shelving for pictures, photos or ornate objects of personal value, while giving the stonework a true sense of depth. Brett added a very strong, defining element to my bathroom with a floating rear wall made of stone. He asked me a lot about what feel I wanted for the room but also about how we would actually use the bathroom. He then designed features in the wall to create interest from the entrance, bath and the shower, providing something special to look at from each part of the room. The result is stunning, the stone never ceases to amaze those who enter the room and I still enjoy looking at it everyday. Brett seems to have a real eye for how stone can add to a space.